Education and library storage areas are evolving and Systems & Space can help you transform along with it. Take a look at our solutions. It’s More Than a School or a Campus. It’s a Community. Today’s educational campuses are evolving. From high schools offering an increase in STEM (Science, Technology, Engineering, and Mathematics) education and online courses to community colleges embarking on 4-year programs, it’s become more important than ever for educational institutions to offer a variety of valuable options in order to attract and retains students. A strong, diverse school community is the key to student engagement and achievement. With these changes comes a growing need to better utilize available space. Limited space to store books, research materials, athletic team equipment, school records, and more creates disorganization, inefficiency, and an environment that limits learning and growth. For nearly 30 years, the storage experts at Systems & Space and our Spacesaver partners have worked with countless educational institutions to create the best possible space for every inch of their communities. The traditional library concept—a collection of books in a building with people reading them quietly—is shifting. Increasingly, libraries are becoming anchors for their communities, reaching beyond books and materials to provide seminars and classes, collaborative workspaces, media labs, and more. At the same time, technology consistently transforms the way information is consumed. From e-books and online courses to live trainings and hand-on learning, there are plenty of mediums competing for space in today’s libraries. That’s not to say that books, periodicals, microfilm, audio, and video are a thing of the past—far from it. To accommodate everything, libraries have to get creative with space. Fine art collections need proper storage to ensure their integrity and preservation. Santa Clara University’s De Saisset Museum of Art and History needed a solution to a non-existent space for fine art storage. A Hang Glider Pro with specific dimensions between racks not only allowed them to hang all of their artwork in one place, it also assisted the museum with securing a grant to improve even more of their storage space. College sports recruiters know that the look and feel of athletic facilities play more of a role in recruiting than ever before. This was the case for the University of Notre Dame, who upgraded to mobile shelving from static wooden shelving that was wasting precious space. The high-density compact storage system doubled the amount of equipment that could be stored in the same footprint. 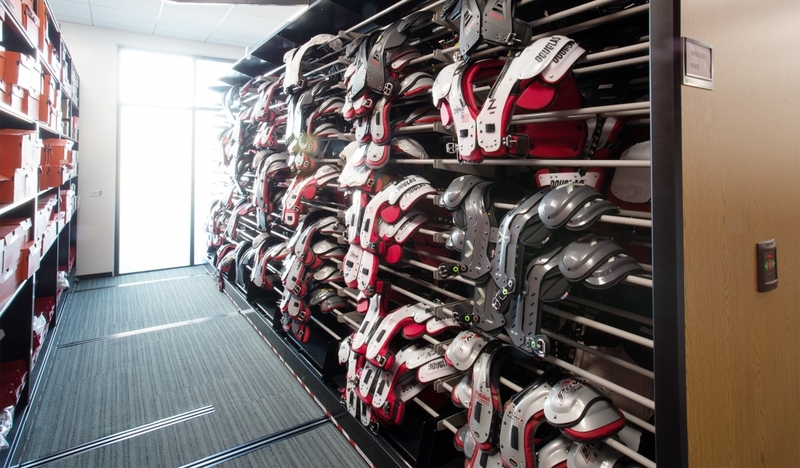 The system is one piece of a completely renovated football storage room that has become a showpiece for the Division I school. See how the Stanford University Arrillaga Family Sports Center utilized Spacesaver’s mobile shelving systems to maximize their facilities storage space. Campus retail outlets need organizational methods for quick retrieval and access to stock—and the IT Employee Store at Lawrence Berkley National Labs was no exception. Employees couldn’t get work done in a very disorganized stockroom—and with a FrameWRX Modular Bin Shelving System, we were able to double the storage in the existing footprint and offer flexible options for hanging inventory. Keeping students safe—the primary goal of campus police. At Stanford’s Public Safety Department, the Chief was retiring, and wanted to build a new locker room for his officers before his tenure was through. In utilizing banks of FreeStyle Personal Storage Lockers in the room, the officers had a customized space of their own that could fit extra uniforms, protective boxes for guns, storage for personal items, and a separate drawer to keep boots and helmets upright. Keeping equipment in one central location added to the productivity of personnel—resulting in a better day on duty. On-campus hospitals and clinics are typically smaller than the average public healthcare facility—and with smaller medical buildings come far less space for supplies. Healthcare storage solutions such as the FrameWRX Modular Bin Shelving System can increase efficiency and organization, helping healthcare practitioners on campus spend more of their time treating students. Similarly, medical and science laboratories require workstations suited to their specialties. Utilizing modular millwork furniture will help your lab strike that balance between people, equipment, workspace, and logistics. Digital records are king on college campuses—but in administrative offices, there’s still a need for paper and supply storage. High-density mobile shelving can give you organized and immediate access to files and records, and for those that need to be kept confidential or under restricted access, PIN pad and audit trail capabilities can be added for extra security. For environments such as campus mailrooms, modular millwork allows you to configure storage as needs change. The storage challenges on a campus or library are endless. Check out our “School Your Space” Lookbook to get ideas on how smarter storage can transform your educational community.